Good evening "bush" walk in the Black Hill CP. You will be rapidly rewarded with great views of the city and maybe a sunset. Previous years have yielded kangaroos, koalas and echidna. Get up the hills and ready for a magnificent new walking season in style. 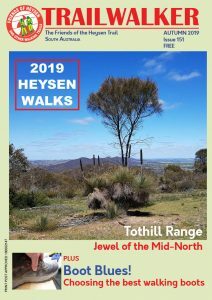 Begin on the Ambers Gully track, up the Yurrebilla Trail, around the Sugar Loaves and then amble back down the Ambers Gully walking trail. Total time about 1hr 45 min, with the first 50 minutes approximately uphill, so a steady workout. If hot (above 32C), we will go 45 min each way down Linear Park from the same starting point. Then for those with an appetite, we can adjourn to Cafe Va Bene, Campbelltown, for a meal. Please let me know if you wish to eat with, us so I can book.